Has your child ever asked you to draw something specific and ended up proclaiming “What’s that!” at the final product? I have had a few of those moments, especially when it comes to drawing elephants. Now you can draw like a true artiste with a lending hand from ScribbleBot. 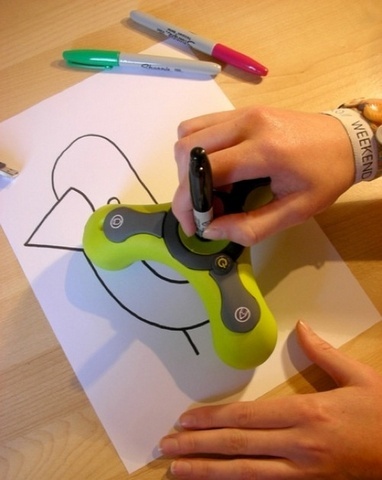 Designer Jon Cumberpatch designed the ScribbleBot to encourage adults to draw. ScribbleBot is essentially a wireless printing device that follows pre-set drawing paths downloaded from the computer. The fun is in getting to hold it, so you appear to be driving the pencil. The ScribbleBot is under development and is not available for sale as yet.